What did C-Job achieve in 2018? 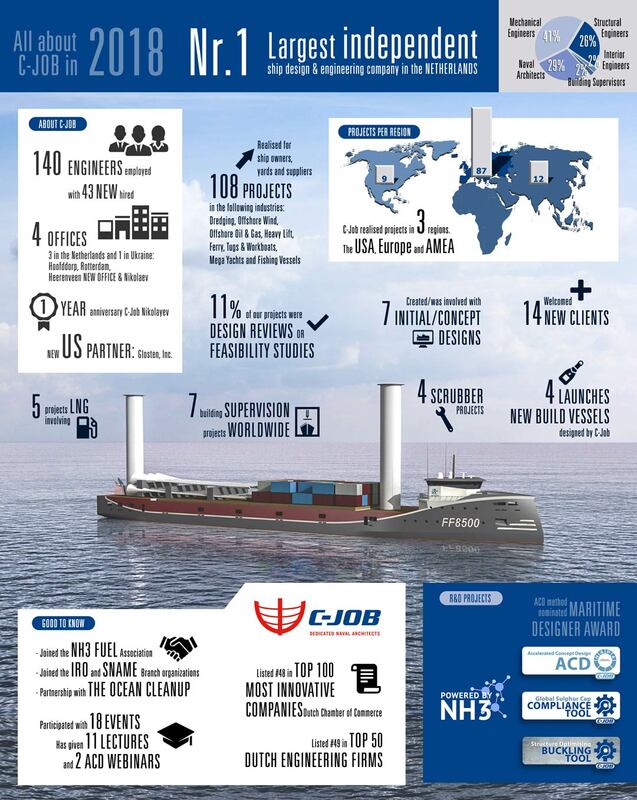 Check everything you need to know in this infographic about C-Job, the largest independent ship design & engineering company in the Netherlands. Ship-owners considering an investment in wind-assisted propulsion are faced with numerous questions. C-Job’s own long-term research, supplemented by additional graduate studies, means that they are the go-to partner for ship-owners looking for independent advice. C-Job Naval Architects is proud to announce that two of its engineers have been asked to participate in two International Ship and Offshore Structures Congress committees. The strength of an engineer lies in not only in the knowledge that they have but also in the application of their knowledge. General Manager Jeroen Liesveld talks about the importance of training and development at C-Job. Join our mailing list to receive the latest news and updates from C-Job (about 5 times a year).